When we linger in the borderland on purpose, we become our own experiment. How do you know you aren’t improvising? A reflection inspired by a performance of Steve Paxton’s Flat and Satisfyin Lover, and of the Goldberg Variations (after Steve Paxton), by Jurij Konjar, in Lisbon (09/03/2019). The body of the dancer moves as if pulled by the strings of a puppeteer. The hand reaches out, leads the arm, shoulders, head, neck and torso, only then followed by the legs; then a pivot at the waist and the body turns upon itself, bends over, rolls, sits, stands, now led again by an outreaching hand, in another direction. One keeps looking for the puppeteer, for the centre of all this movement, or series of movements-events layering and texturing a larger singularity, until the revelation that there is none, that the centre and the movement are one, that the movement is its own unity; that it exists as a singularity in movement. 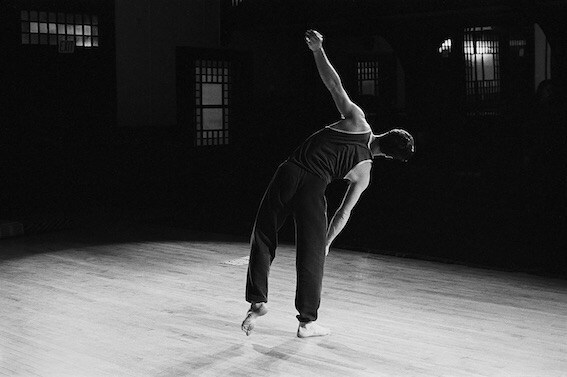 Without beginning, middle or end, the dance-movement(s) erupt onto the “emptiness” of the stage, creating its/their own space-time/time-space, a counter-point movement to the “movement” of Bach’s Goldberg Variations. The illusion of a marionette arises from gestures that seem to decentre the subject, the consciousness of the dancer, only to recentre in the movement, in the weaving together of the movements themselves; decentring and recentring as the very life of movement. Our perception insists on a horizon with a vantage point; centuries of “perspectivism” weigh heavily on the mind and body. Where in the movement is the master choreographic consciousness? Illusive perhaps, but we stubbornly and habitually believe it must be present, for without it, there can be no creation. The moment of wonder begins in the discovery that the dance is its own self, that it is “improvised”: decentred, self-less or freed from the self, only to be centred “elsewhere”. And we then begin to see what we do not normally see: standing, stretching, bending, walking, sitting, in sum, the vast and simple repertoire of which all human movement is composed. And we then watch as children, at the free, simple beauty of movements danced in and with time and space. The decentring however is not the consequence of a trance state: a loss of self that only encounters another, presumably deeper, more fundamental self. The “truth” of the dance is not hidden beneath or above what can be sensed, seen, but is found in the expansion of the senses to what is commonly ignored. Nor is the improvisation “thoughtless”. Thought in this instance though is not the guide or the master, but a “partner” in a dance with the “body”, a dance of mutual respect for each, but which in movement engenders a third reality, something greater than its parts, an embodied-mind or mind-embodied creating a space-time in dialogue with our common ground, the earth. Logicians teach that arguments from analogy are fragile. But the solidity of the logicians validity and truth is attained only at the cost of abstraction; a solidity, in other words, that masks its own fragility by closing its eyes to the world, or put differently, its own roots in analogy, for among the latter’s most ancient meanings, we find “based upon a picking out of words”. We will thus play with analogies. Let us imagine “political movement(s)” as without beginnings or ends, as eruptions into the scripted and choreographed time-space of governed histories-societies. Let us accept that they have no centre, and that they should not have any centre if they are to remain movements, escaping capture in apparatuses of control. The singularity of any movement will be created in and through the movement; indeed, the movement is its very singularity. Should a movement gain life, its plurality of expressions will “lead” it in a multiplicity of directions. These may cohere, express a structure, momentarily, or for the duration, or not. But should they do so, it will be a unity in movement, a unity constituted through gestures of decentring and recentring, which is the very meaning of autonomy. Radical political movements (the riot, the insurrection, the revolution) will always be improvised (as are the responses of authorities): they simultaneously reveal and break habits, and they defy planning and leadership. As to what causes their emergence and/or defines their end, this will always ultimately defy our knowledge (even in hindsight). All we can do is awaken to the new times and spaces created, and join the movement like a dancer in a “contact improvisation”. This entry was posted in Commentary, Poiesis. Bookmark the permalink.